Before this week, I’ve only used my ice cream maker at most 3-4 times and I’ve had this ice cream maker for many years now. I’m not sure what the sudden change is but I’ve managed to make 3 ice creams in the past 4 days. That’s almost 1 litre of ice cream a day! Even though the weather is getting a little warmer, making that many ice creams is getting insane. Or is it? Not for the ice cream lovers it’s not! I’ve already had requests from various friends and blogger friends to come over and ‘help’ me eat them so I suppose at least they’ll find good people to feed. 😛 I may have to send out invitations soon since I’m running out of freezer space to fit them all and I still have plans to make more! There’s something oddly satisfying watching that churner go. It’s hard to contain my excitement when I see little ice particles form in my runny ice cream mixture and then finally seeing it turn into ice cream form. Is it the same for you or am I just strange? 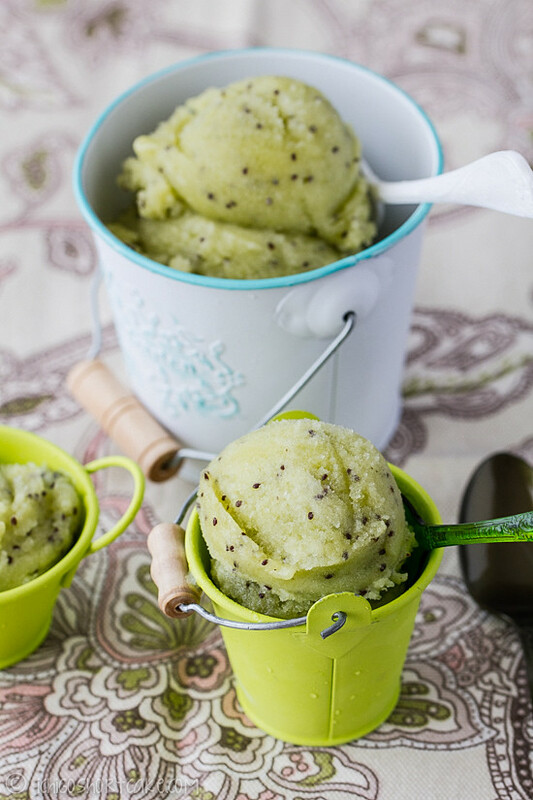 Since I had many kiwi fruits sitting there, some of which were quite ripe, and the task of eating them all seemed a bit daunting, I thought it was a good idea to make it into a sorbet instead. Instead of the usual sugar, I decided to add part honey and part sugar for a more rounded and deeper taste. It’s also because I just bought a 1kg of honey. I can feel a fantastic Summer coming, full of wonderful ice creams and icy poles. It’s too bad I’m spending almost half of it in wintery China again, but of course for a good cause since my grandma is turning 99! I used yuzu liqueur (a Japanese citrus fruit) which I bought in Tokyo, although the amount I put in didn’t make too much difference to the ice cream mixture. This of course you can leave out. Question time: Do you have an ice cream maker? Do you use it often? Do you prefer ice creams or sorbets? 1. 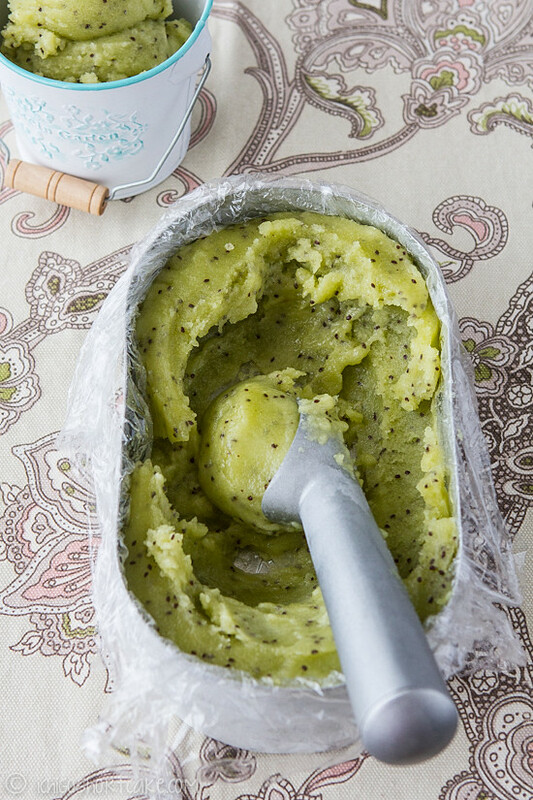 Blend diced kiwi fruit in a food processor until pulp is smooth. Set aside in a large bowl. 2. Combine water, honey and sugar in a small saucepan and heat on medium high, stirring until all the honey and sugar has been dissolved. 3. 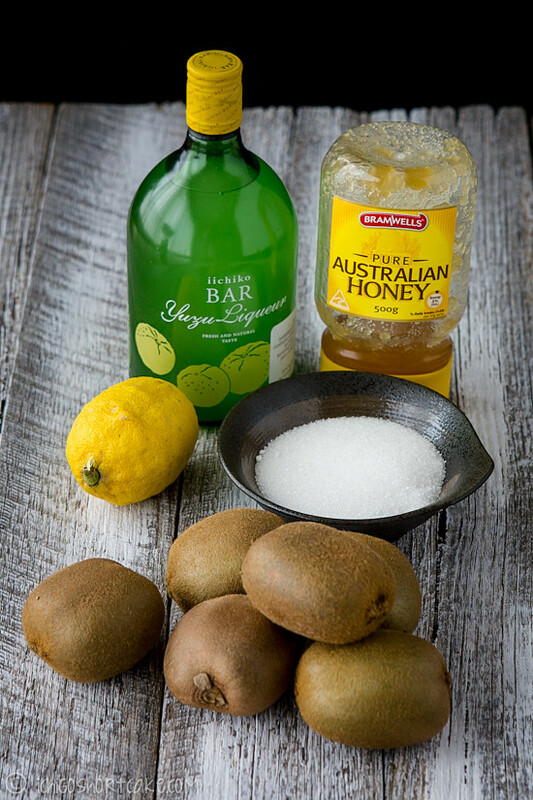 Cool the sugar mixture slightly before adding it to the kiwi fruit. Also add in lemon juice and yuzu liqueur and mix thoroughly. 4. Cool the sorbet mixture completely. 5. Add mixture to an ice cream maker and churn for roughly 20 minutes or until the desired consistency. 6. 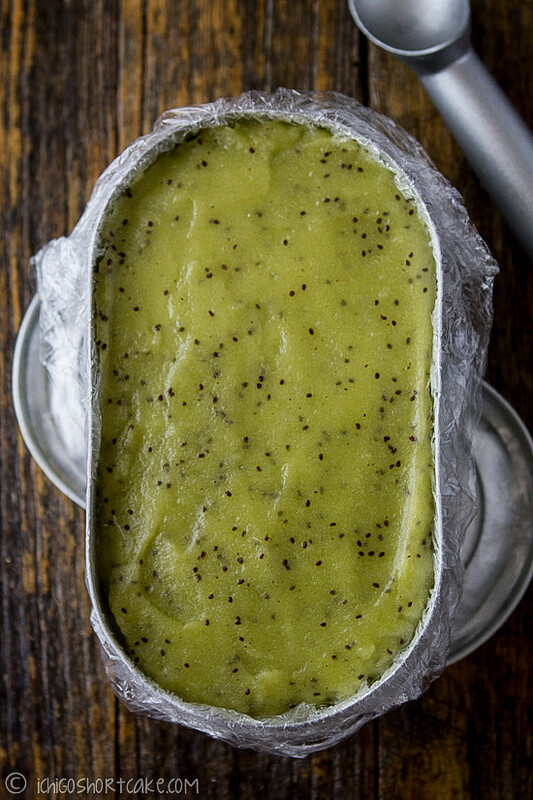 Transfer to a container and freeze for at least 3 hours before consuming. yum, great choice of fruit! ive never had kiwi sorbet yet, loving the bright colour! Love your posts! Your pictures always make me drool…. I wanted to ask, where could I get some of that yuzu liqueur? Beautiful photos! And it is a lot of sorbet to make but it just means you will need to invite your friends over for a sorbet party 🙂 Happy Halloween! Jenny, this icecream looks fabulous!! Lets hope you can eat all that icecream in your freezer before summer comes around and you really need to make some room for more! Very impressive. 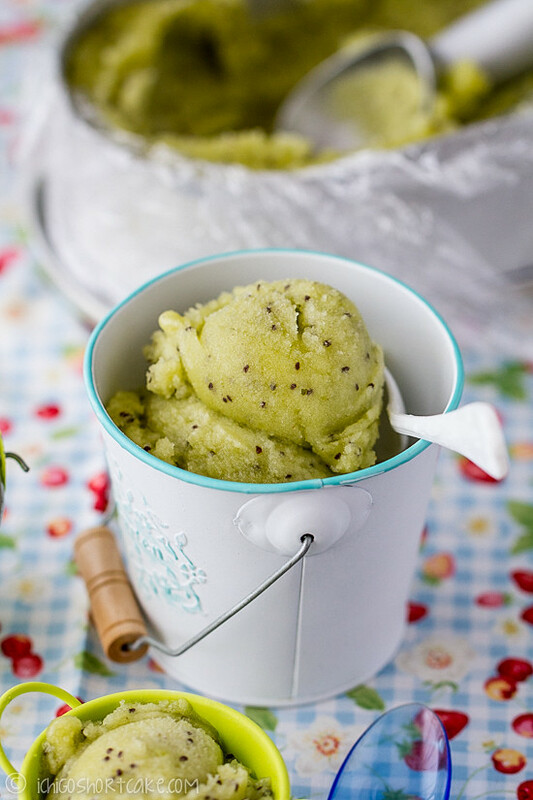 I never knew you could make sorbet in an icecream maker. And kiwi sorbet, that is very creative. I would love to try this. I agree with Ms I-Hua it’s very kiwi-ish! Like as soon as you see it you know it has kiwi in it 😉 I’m guilty need to use my ice-cream machine more! Great looking sorbet! Love the flavors. I have an ice cream maker that I don’t use very much, alas. 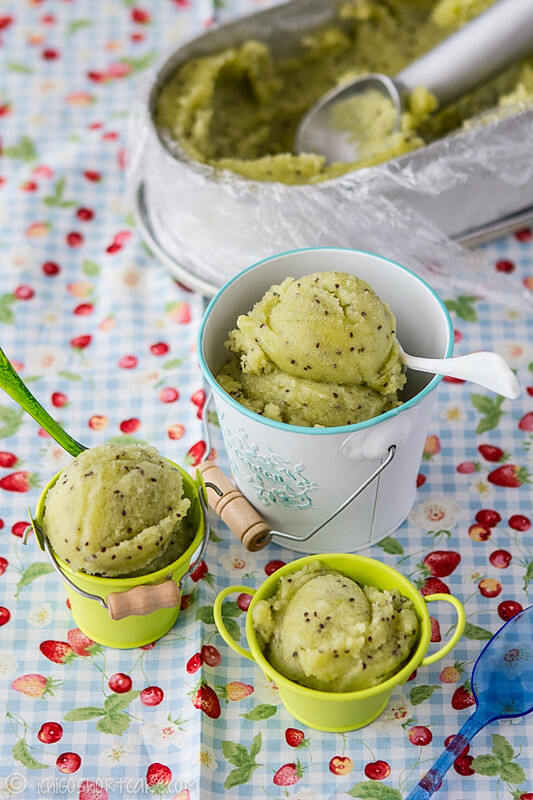 And I actually prefer making sorbets than ice cream, so this recipe is right up my alley! Good stuff – thanks. You see, I was SO close to buying an ice-cream machine in the summer. Glad I didn’t now, although I think they are great, but like you – I wonder if I would just use it maybe 3 times and then stash it in a cupboard. Glad yours is getting use now though – and what a fantastic looking sorbet – beautiful colour! Hello! I found myself with an abundance of kiwis (more than I could feasibly eat before they were too ripe), so I tried your recipe — absolutely delicious! Thank you for the recipe.